A few weeks ago I introduced Lydgate’s “As A Mydsomer Rose” with some concepts/techniques and a discussion of the poem’s mechanics. Here I want to get into the actual poem and look at some of the language he used. The poem begins easily enough with an attribution of all human qualities to God, meaning we cannot take credit or feel pride for qualities we are not responsible for. Al stant on chaung like a mydsomyr roose. As is apparent from the last line of the first stanza (a motif that will be carried throughout), nothing is permanent – like a mydsomer rose everything changes, degenerates, withers, and dies. Yet this is not a new concept; poets from classical times to Lydgate’s contemporaries used the rose as a symbol of ephemeral beauty (such as the Roman de la Rose). Alain de Lille explored the motif throughout his Latin poetry (in which roses were often a central image). And Lydgate himself played with the image and even this exact refrain throughout some of his other works. The thorn is sharp curyd with fressh colourys. Al is nat gold that outward shewith bright. Here the imagery is of rebirth and rejuvenation where each image is of a thing at its most viral point in life and full of promise: flowers opening, dawn beginning the day, the lark welcoming the morning. But with these images comes the realization of an end where dawn turns to dusk, birds go to sleep, and flowers close. Here the juxtaposition is a bit more subtle as the organic sense of this scene allows for the possibility of reincarnation as opposed to absolute death – at least briefly. So the mydsomer rose, the portent of death, functions in direct opposition to “Aurora” and the “larke,” who will rise again tomorrow. Ther is a maner straunge difference. On frssh baunchys syngith the woode wale. Iayes in mysyk haue smal experyence. Of soffte or sharp like a mydsomyr roose. Al stant on chaung lyk a mydsomer roose. The first thing that came to mind when reading this stanza was the distinction between a parliament of animals and that of a parliament of birds (Chaucer). Granted, the reasoning for holding a congregation is different, the idea is quite interesting. Apparently the wolf’s complaint agains the lamb is not unique, but the concept of a parliament to address the issue is. Then I found another similar instance in Lydgate’s “Debate of the Horse, Goose and Sheep.” Although this all seems very fable-like, according to MacCracken, Lydgate may have been the originator of this concept since it is not in fact a part of the fable tradition. The aureat noumbre in kalends set for prime. Who sittith hihest moost like to fall soone. This stanza directly addresses the passing of time and the changes which come with it, especially focusing on the fickle nature of fortune as she weaves in and out of a person’s life as she sees fit – again, not a new concept, and was probably inspired by Boethius’s The Consolation of Philosophy which served as an inspiration to many different medieval authors. However, the most fascinating part of this stanza is the language used, denoting a familiarity with calendars, specifically perpetual liturgical ones. It has been argued that “kalends” in this instance is the first such use of the word to refer to a calendar. I don’t know if I agree. The “aureat noumbre” refers to the number of the lunar cycle by which the date of Easter is calculated. “Prime” is a sequence of numbers ranging from 1 to 19, applied to various days, and it is the golden number, used for locating the age of the moon on a given date. “Kalends,” when reading a perpetual calendar, is the first of the month. So what is literally being stated is that Easter happened on April 1st, which in 1432 it did, coincidentally within the time frame that the poem is thought to have been written (currently narrowed down between 1431 and 1440). While this may have been the first instance of “kalends” being used in a metonymical sense to represent a calendar as a whole, I would go as far as suggesting it as a means of actually dating the poem to 1432. Whan western wawes his streemys ouer-close. Al stant on chaung lyke a mydsomyr roose. This is a very straight forward representation that once again picks up on the idea of the setting sun as an exemplum of change where the sun functions as the connecting point between the first and second half of the stanza, as both halves tie in with the change of the mydsomer rose. While the language here is quite beautiful what I find even more interesting is the variation between manuscripts which is the most pronounced in this stanza. The stanza seen here (that follows the B tradition) is completely altered from the A variation (with a bit more of a discussion about that here). With wynter froosts that they dar nat appeere. Al clad in russet the soyl of greene is bare. Now reyn, now storm, now Phebus bright and cleere. Once again we encounter ideas or phrases that originated in earlier works and others that will reemerge in later ones. This stanza brings to mind Chaucerian language from Troilus, while serving as an early reflection for the Fall of Princes. The ubi sunt motif that is going to begin in earnest in the next stanza is already beginning to take shape as the whereabouts and transience of various entities is being addressed. Of al Iuda, moost famous and notable? richest of bildyng, of trsour incomparable? Face of Absolon, moost fair, moost amyable? With his tryumphes moost imperyal? Of al Ynde in his estat roial? Failed leiser his testament to dispoose? Wher is Tullius with his sugryd tonge? Or Crisistomus with his golden mouth? Of Omerus in Greece both north and south? Of moral Senek, the mysterys to vncloose? Which [th]at in Gawle had the governaunce? Vowes of the Pecok with al ther proude cheers? The worthy nyne with al ther hih bobbaunce? Troian knyhtis, grettest of alliaunce? The flees of gold, conqueryd in Colchoos? Rome and Cartage, moost souereyn of puissaunce? Al stant on chaung like a mydsomyr roos. 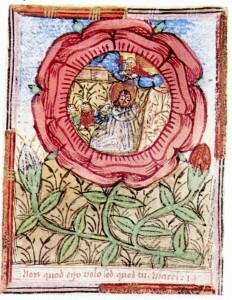 At this point the catalog of names in the motif is part of convention – the various figures only serve to remind the reader of their likeness to the mydsomer rose. There are also buried within the line numerous allusions to earlier or even contemporary works with which Lydgate’s audience would have been familiar. Further, he once again self-references, in an almost cryptic manner that relies on knowledge of his previous works for understanding. For example, “the worthy nyne” is a direct mention to his “That now is Hay Some-tyme was Grace” where the nine are actually named (note: most of the online versions you will find do not include the entirety of the poem, only focusing on the “catchy” refrain.” There is *a lot* more to it). However, this last reference is most appropriate since these two poems are considered sister poems written for Queen Kateryn. Without delving too deeply into the second poem, mortality is the central and unifying concept between the two. Fressher than lilies or ony somyr roose. Here the imagery becomes more clear as he sets up the martyrdom of the rose, completing the imagery of the rose as the epitome of mortality. First, a quick note on his “Theban legioun” that alludes to the Fall of Princes. Here the “legioun” is a symbol of martyrdom further perpetuated on the “stage” that is the martyr’s scaffold. This “legioun” historically refused to pledge to pagan gods through sacrifice as described in Jacobus ad Voragine’s Legenda Aurea. Ground considerid, is bilt on rihtwisnesse. Withoute trouth what vaileth hih noblesse? Ther bloody suffraunce was no somyr roose. Splayed in teh baneer at Ierusalem. Of whos five woundys prent in your hert a roos. Floral imagery was an extremely familiar means of describing both Mary and Christ in the Middle Ages (lilies and roses being very prominent forms), just as the comparison of Christ’s wounds with roses was commonplace. By this point in the poem the rose should immediately signal the juxtaposition between the ephemeral and the heavenly. I think these last stanzas really capture the physicality of Christ, and paradoxically emphasize his transcendence by focusing on his flesh. 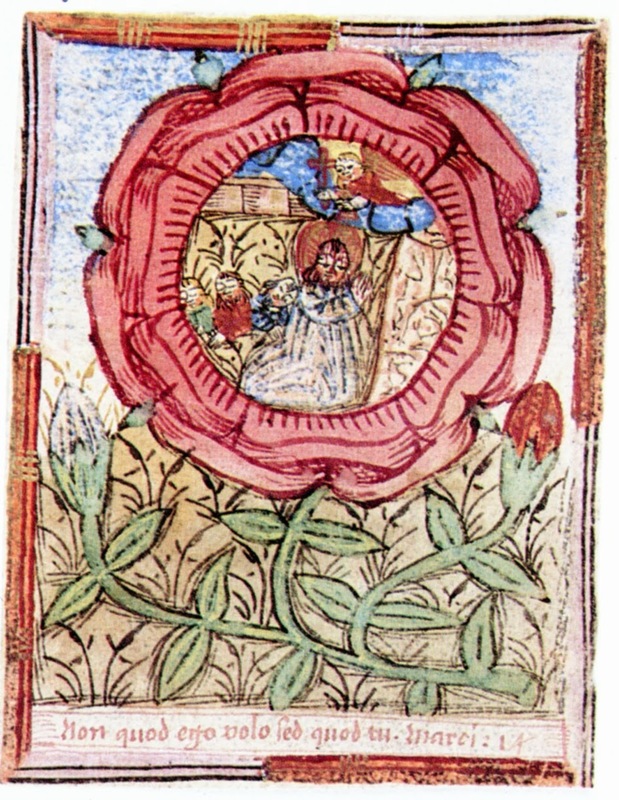 Here the image of the rose and Christ’s five wounds become superimposed as the iconography shifts to that of a single five-petalled rose. Personally when reading this the first thing which cropped into my mind was Gawain’s shield that remained within focus throughout the story, expanding towards infinity through the catalog of fives that ascended from the trivial to the eternal. Thus the rose moves from the image of fleeting worldly beauty in the first stanzas, to a more substantial query into mortality and the meaning of life, to finally taking the place of the symbols of eternal salvation, and consequently serving as a reminder of what it means to be human. Ebin, Lois A. John Lydgate. McCracken, Henry Noble. The Lydgate Canon. —. Minor Poems of John Lydgate. Scanlon, Larry, and James Simpson, eds. John Lydgate: Poetry, Culture, and Lancastrian England. I really enjoyed both of your Lydgate posts. I think they reflected a beautiful facet of his poetry that often goes neglected in the classroom which is to say that perhaps it was for the best that you were never formally educated in Lydgate and managed to self teach. Were these two posts a combination of a conference paper? If not then I might suggest you should try to present this poem. I think it would do very well.